iRealHousewives | The 411 On American + International Real Housewives: Luann de Lesseps Charged With Felony After Druken Palm Beach Arrest! Luann de Lesseps Charged With Felony After Druken Palm Beach Arrest! Us Weekly reports that Real Housewives of New York City star Luann de Lesseps has been charged with one felony, resisting an officer with violence, and two misdemeanors, trespassing in an occupied structure or conveyance and disorderly intoxication, following her December 24 drunken arrest in Palm Beach, Florida. TMZ reports that de Lesseps may face up to five years in prison for the felony charge. As previously reported, de Lesseps, 52, was arrested in the early hours of December 24 in Palm Beach, Florida. She was originally charged with charged with battery on a law enforcement officer, resisting arrest with violence, disorderly intoxication and corruption by threat. The Palm Beach Police Department confirmed to Us on December 27 that Lesseps trespassed in a hotel room with an unidentified man before she was arrested. As previously reported, Luann was arrest in the early morning hours on Sunday, December 24 and charged with disorderly intoxication, battery on an officer/firefighter/EMT, resisting arrest with violence and threatening a public servant, according to the Palm Beach County Sheriff’s Office. She had been discovered trespassing in a hotel room with an unidentified man, according to a police report. The pair had entered the wrong room at the Colony Hotel in Palm Beach and refused to leave. According to the report, de Lesseps “shoved” a police officer who responded to the scene and “slammed” the bathroom door on his forehead. De Lesseps later also told the officer “I’m going to kill you all,” according to the police report. Luann checked into rehab following her arrest, and returned home from treatment on Tuesday, January 23 and resumed filming of Season 10 of RHONY. The Bravo reality star took to Twitter to confirm the news. "It’s good to be home. I’m doing great. Spending time with friends and family. Thanking everyone for your continued good wishes and support xo," she wrote. Ramona Singer shared a photo in a now deleted Instagram post of all seven ladies, as they continue to film for the show's upcoming tenth season of the Bravo hit reality series. 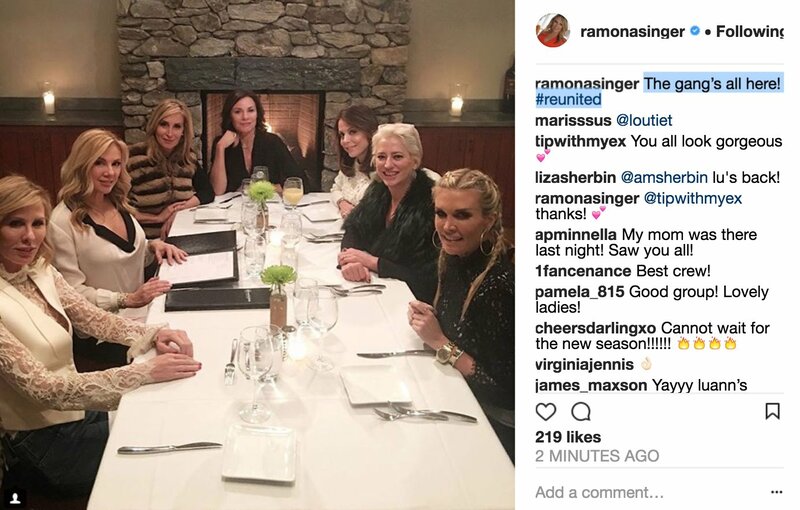 Singer shared a photo of herself and de Lesseps, along with Carole Radziwill, Sonja Morgan, Bethenny Frankel, Dorinda Medley and Tinsley Mortimer having dinner together with the caption, "The gang's all here! #reunited"
A source revealed that Luann left the facility on Sunday after a 21-day treatment and has resumed filming RHONY. "She sounds amazing. Very clear-headed," the insider told E! News. "She's in a good space right now." The Bravo reality star was seeking treatment at a rehab center in Jupiter, Florida. A source tells E! News, "She is going to be sober. She’s serious about it."